New car technology benefits drivers, but how does it affect body shops? - AutoInc. I was talking to a group of body shop owners the other day at a trade association meeting, and one said, “I’m not in the repair business anymore. I’m in the computer business! To find out about the present and future of automotive diagnostics, we interviewed one of the country’s leading experts on the subject. Michael Flink, national trainer/commercial product sales manager, has more than four decades of aftermarket experience. 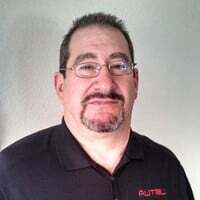 He has spent the last seven years with Autel, one of the world’s leading manufacturers and suppliers of professional diagnostic tools, equipment and accessories in the automotive aftermarket. Michael Flink: In 1982, diagnostics really took off, even though the very first computer-controlled system hit the market in 1979, when Chrysler introduced its Lean-Burn system in the K car (Aries, Reliant, LeBaron) An early computerized spark-advance control system consisted of three parts: the carburetor, the spark-control computer, and a group of eight external sensors. By the early or mid-80s, GM had the Electronic Spark Control System (ESC), which was the beginning of the computer age in cars with check engine lights , followed by OBD-II and then CAN (Controller Area Network) and then the beginning of ABS (Antilock Brake Systems) and TPMS (Tire Pressure Monitoring System). I witnessed all of these generations and evolution with those systems and now we’re going through it again with ADAS (Advanced Driver-Assistance Systems). Michael Flink: The collision repair industry is now going through the same thing the mechanical repair industry went through in the ’90s and early 2000s. When OBD-II came around, shops realized that they had to have a scanner to do anything on these cars, and when CAN hit around 2004, it became more important for body shops. The collision repair industry has done a wonderful job within the last few years of pricing out any type of technician because body shops didn’t want to spend money for diagnostic time and the equipment required. They were subletting the work and battle with the insurance companies to get paid for it, and now it’s come home to roost in the middle of their world. So, the insurance companies are starting to pay for diagnostics and the body shops are going to have to have someone on their staff that has these abilities. The early adopters are going to make more money and lead the way, while the latecomers are forced to farm stuff out. It’s killing their cycle time because the dealerships have their own work and can keep the shop’s cars there for 1–5 days, in many cases. The insurance companies are complaining that they have to pay these costs, whether the shop is farming it out or doing it in-house. But if you’re subletting the diagnostics to the dealership, you have to pay for that rental car for an additional week, for example. The dealer’s own work is going to be a priority, so you never really know when you’re going to get the car back. As a result, the body shops that are doing their diagnostics in-house are favored by the insurance companies while those that are jobbing it out are not. Q: What are some of the newer systems that shops will have to be able to repair on newer vehicles? Michael Flink: These carmakers are coming up with new systems and features all the time, so the shops have to stay on top of it. Audi recently announced a new system called V2I (Vehicle to Infrastructure Communication) that will display the ideal speed to drive in order to make all the green lights. It’s only currently available in 13 cities, but if it works, I imagine it will be introduced in every major city in the U.S.
Tesla is constantly developing features associated with autonomous cars; Audi has always been a front runner and Mercedes has some interesting new stuff as well. I travel around the country a lot, so I get to play with all of the new technology, especially when it comes to the self-driving and safety stuff, and I am very surprised and impressed at what KIA and Hyundai are doing. Their lane departure technology seems to be fairly advanced in comparison to others. The supercruise systems from GM and Cadillac are up there with advancements, and Ford is focusing more on the technology in their SUVs and trucks where they’ve developed a system that gives Ford truck drivers (blind spot) trailer coverage, so that the driver can look further and wider with their backup systems. The radar is in the tail light so if you back into something, it’s more than just replacing the light. Carmakers are also further developing new facial recognition systems that deal with the driver’s eyes and where they’re looking and also by monitoring the position of the steering wheel. The ADAS system will attempt to steer the vehicle between the lanes, but if it doesn’t detect some kind of minimum resistance from your hands on the wheel or if it detects that you’re looking down and not at the road ahead. These systems are going to alert drivers with haptic messages that will cause the steering wheel or the seats to vibrate in order to alert the driver. Some of the OEMs are also working on heart rate monitors, so we will likely see a lot of new systems leveraging that. Q: By 2025, will a large percentage of the costs associated with a collision repair be more involved with software calibrations as opposed to actual paint and R & I? Michael Flink: Absolutely. Front collision avoidance, automatic emergency braking, lane departure warning, as well as all of the cameras, sonar, radar and LiDAR are all now connected to some of the braking and wheel speed sensors, brake pressure, electronic power steering, and all of these are reporting. So, it’s the cross-pollination of these systems because it’s not just the ADAS part that’s involved. Active ADAS means that the system is doing something rather than just warning you, and that is where I think that area will really expand considerably within the next 2–3 years. Q: A few years ago, many shops didn’t think that diagnostics were a must, but now they realize they’re becoming more important to fix cars, right? Michael Flink: Diagnostics is at an all-time high with body shops because now the insurance companies are requiring them to do pre- and post-scans, which means they need to own at least one scanner. In the old days, we could just walk around the car and inspect it visually to write the estimate, but today we can’t see everything. What happened was that shops were writing estimates, but then while fixing the car they found out that one sensor was bad, this wire was pinched or module is going to be reset. So, now the shop has to write a bunch of supplements, which is a pain for the body shop and the insurance company, plus it lengthens that cycle time. Another problem is with a car that is near its total threshold, and then the shop finds $1,000 in additional work. Had they done the proper diagnostics, the vehicle would have been totaled, but they’re already committed. That’s why the insurance companies started insisting on getting pre- and post-scanning on each car, so that now they can write estimates for additional sensors, labor time, programming, which allows the shop to write a more complete estimate to start off. By performing diagnostics, you get a definitive view instead of speculating and take all of the what-ifs out of the equation for both parties. Any shop working on cars made within the last four years is going to need at least one individual in-house who can perform diagnostics and have at least one full-functioning scan tool, not just a code reader. That’s the end game, but how do small independent shops get there affordably? Maybe they start out using a subscription service, and once they have someone on their crew who can do the diagnostics, they invest in a scanner. That seems to be a logical path to take. EDITOR’S NOTE: Special thanks to Ed Attanasio and Autobody News for sharing this piece with AutoInc. Online.